1 of 4 On a floured surface, roll out 2 puff pastry sheets (one 17.3 oz box) to 13 x 9 inches; cut each sheet into 4 pieces. 2 of 4 Slice an 8 oz block of sharp cheddar cheese lengthwise into 8 strips (51/2 x 1-inch pieces); place 1 strip on each puff pastry piece, along with a fully cooked apple chicken sausage (from two 12 oz packages). 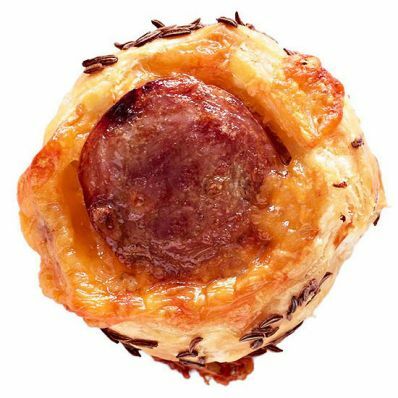 3 of 4 Brush edges with beaten egg, wrap pastry around cheese and sausage, and pinch edges and ends to enclose. Brush pastry with egg and sprinkle with caraway seeds. 4 of 4 Refrigerate for 30 minutes. Slice each pastrywrapped sausage into 6 pieces; place on parchment-lined baking sheets. Bake at 400 degrees for 15 to 18 minutes or until golden brown. Serve with grainy mustard.